Will this new SUV replenish Buick's appeal? The all-new 2008 Enclave crossover SUV was unveiled at the Art Center College of Design in Pasadena, as part of its debut during the Los Angeles Auto Show. It was received with much fanfare along with an appearance from Tiger Woods. The Enclave marks Buick’s first entry into the full-size crossover SUV segment. It is built on an all-new platform capable of carrying eight passengers, the platform is also shared with the Saturn Outlook and GMC Acadia. Buick's previous SUV attempt, the Rainer, was a yet another half-hearted re-badge of the Trailblazer/Envoy/Saab 9-7X/Isuzu Ascender/Olds Bravada permutations. 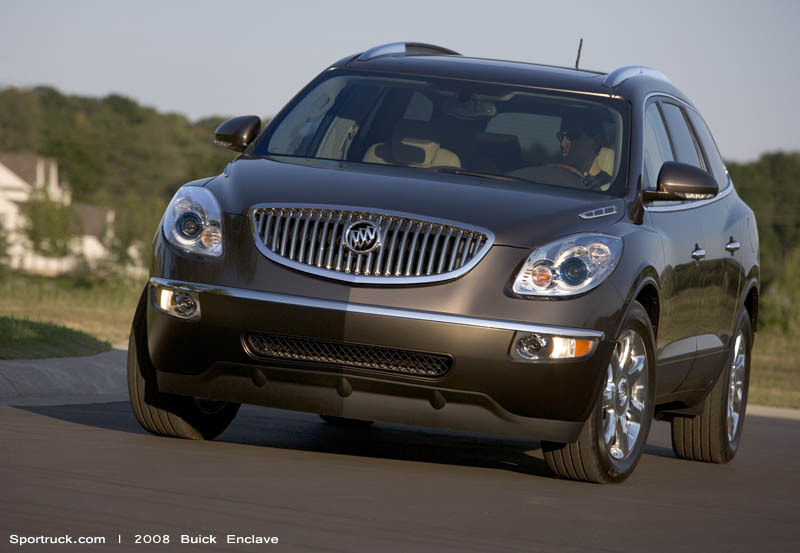 The Enclave is more refined, focused and poised to ameliorate the geriatric Buick brand, lest it suffer the same demise as that of its older sibling, Oldsmobile. The Enclave is more than just a facelift for an aging brand; it seeks to carve its own niche in the red-hot crossover market. A combination of luxurious interior and distinctive exterior along with confident handling along with room for growing families. This is not your father's Buick. The exterior is true to the Enclave concept that Buick debuted January in Detroit. It features a vertically-bared grill in roughly the shape of an elongated shield, that will be shared with future Buick offerings. The grill is flanked by modern high-intensity discharge headlights. The HID lamps are standard and feature both low and high beam lamps. Articulating headlights that follow the direction of the front wheels are available. The sculpted hood features neo-retro chrome portholes. 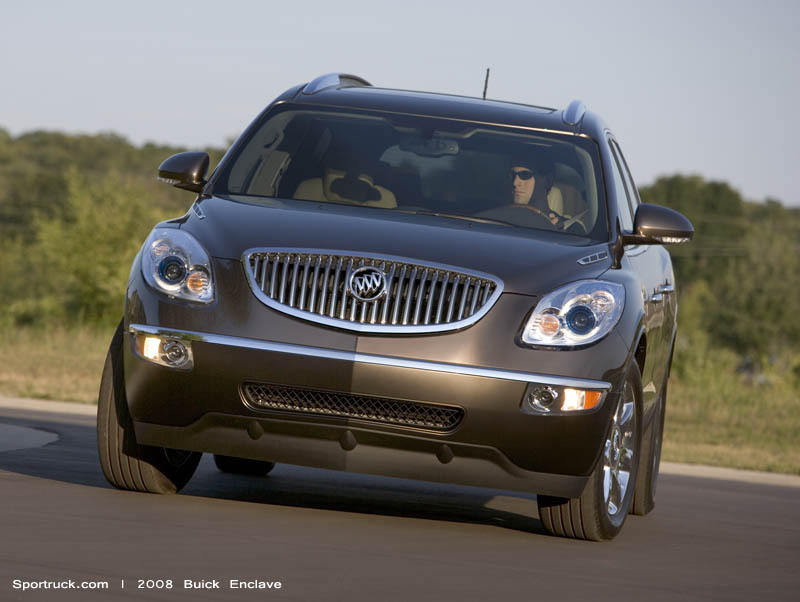 A wide track and short front and rear overhangs give the Enclave a bold exterior appearance. The upswept beltline and sloping roof accentuate the sport stance. The exterior also receives power folding mirrors with integrated turn signal lights, chrome door handles, chrome roof rails and chrome window trim, while prominent 18-inch chrome wheels standard on CX trim, 19-inch are standard on upscale CXL trim. Inside, extra attention has been given to fit and finish, while soft and low-gloss materials are bettern than the average Buick. A healthy mix of sound reducing materials are spread throughout the interior to block and absorb excess noise, and work in conjunction with an acoustic laminated windshield, laminated safety door glass, and triple door seals. 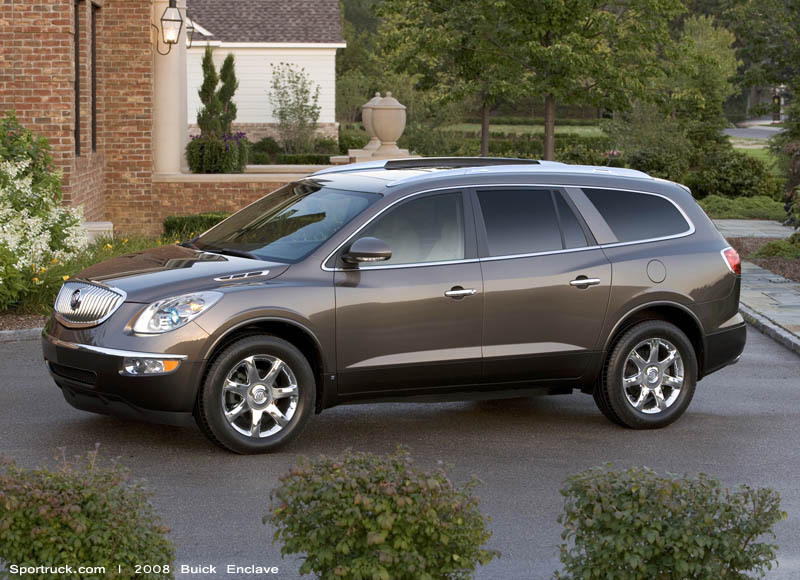 Even when onfigured for seven or eight passengers, with the thrid rows of seats up, the Enclave features 18.9 cu. ft. of cargo space. Interior cargo area can be maximized to 116.2 cubic feet with all rear seats are folded. 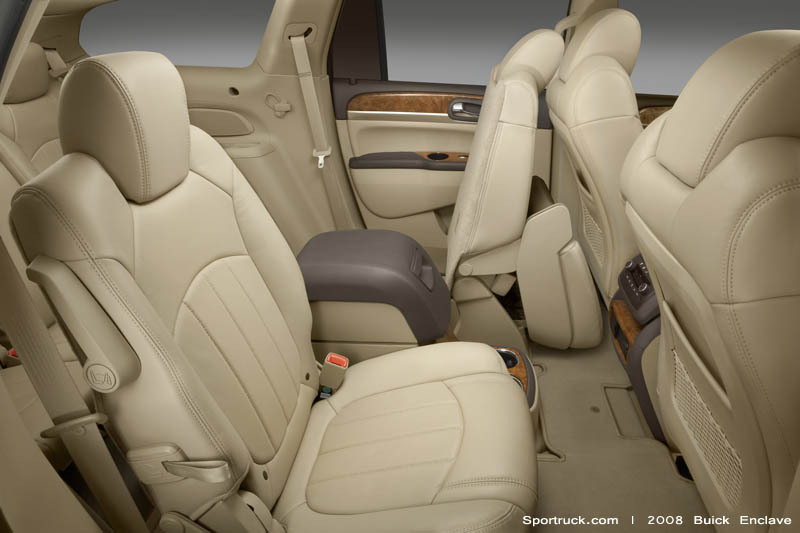 Bucket seats are standard in front, while the second row can receive either standard captain chairs, or an optional second-row 60/40-split bench for three passengers. The standard third row features a 60/40-split bench seat that can accommodate three passengers. Driving the Enclave is a breeze thanks to variable-effort power-assisted rack-and-pinion steering supported by independent front and rear suspensions. The front suspension is a MacPherson strut design, with a direct-acting stabilizer bar and aluminum steering knuckles. Isolated mounting points help reduce noise and vibration. The rear suspension uses a compact, state-of-the-art linked H design, which has an isolated mounting system that reduces noise and vibration transmitted to the passenger compartment, while maximizing interior room. The Enclave comes standard in front wheel drive, and is available with an intelligent all-wheel-drive system for improved traction on slippery roads and assists handling in difficult situations. The system can adjust the amount of torque to the rear wheels automatically, delivering power to the wheels with the best traction. Getting around is facilitated with one of the most powerful V6 engines GM has ever produced: a 275-horsepower V-6 engine with variable valve timing (VVT). 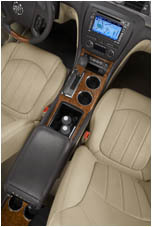 It is mated to a six-speed automatic transmission. This modern 3.6L engine features 251 lb.-ft. of torque, and is equipped with dual-overhead cams. The engine was developed jointly with GM technical centers in Australia, Germany, Sweden and North America. The engine uses full four-cam phasing, rapid data processing and torque-based engine management to increase power, economy and offers improved emissions performance. The engine's four-cam phasing operation of the variable valve timing system ensures linear delivery of torque across the rpm band, while features such as electronic throttle control deliver crisp, immediate response and feedback. The engine uses electro-hydraulic vane-type phasers, allowing infinitely variable combinations to optimize performance and efficiency. A new Hydra-Matic 6T75 electronically controlled six-speed automatic transmission put the power to the wheels. The wide 6.04:1 overall ratio helps the transmission deliver both performance and fuel economy, enabling up to 7 percent improved performance and up to 4 percent improved fuel economy when compared with current front-wheel-drive four-speed automatics. The transmission has been designed so that the Enclave can be flat-towed in FWD and AWD configurations. 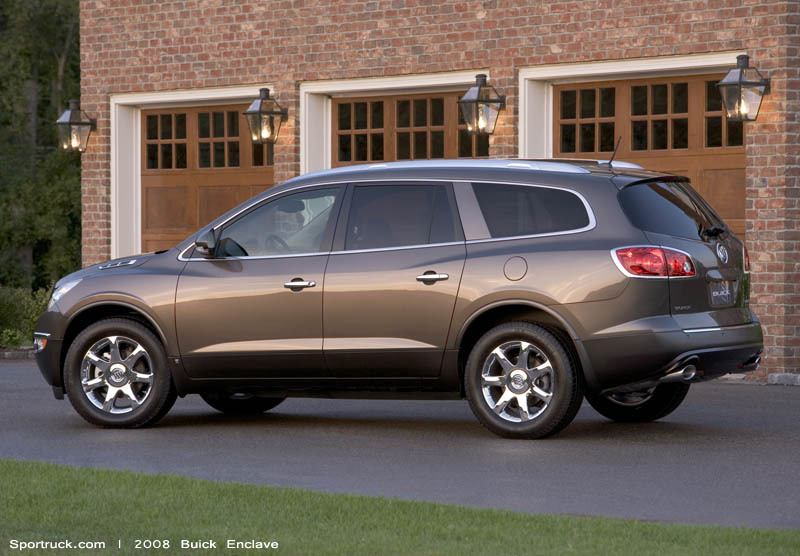 Additionally, the Enclave can tow up to 4,500 pounds when properly equipped. Convenience features include a power-operated rear liftgate, rear back-up camera, and ultrasonic rear parking assist. Also available are a Voice-activated and touch-screen DVD navigation system, a Tiffany-style analog clock, Bose 5.1 10-speaker surround sound system, XM Satellite Radio, and a Rear-seat DVD entertainment system. Safety features include four-wheel anti-lock brakes, traction control, StabiliTrak electronic stability control system with rollover mitigation technology, and a tire pressure monitoring system. The Enclave features OnStar Generation 7 with Turn-by-Turn Navigation. This fully integrated GPS navigation system allows occupants to talk to a live advisor, who in turn sends step-by-step directions to the vehicles OnStar system, where they are automatically played through the vehicle’s stereo as needed, triggered by the GPS system. 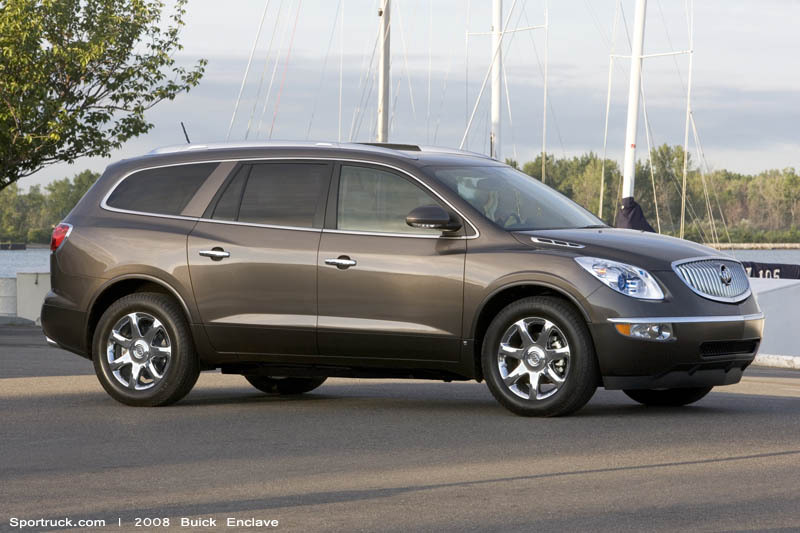 The Buick Enclave will be built at GM's new Lansing Delta Township assembly plant in Lansing, Michigan. The Enclave is backed by a four-year, 50,000-mile bumper-to-bumper warranty as well as five-year, 100,000-mile powertrain coverage. Pricing has not been announced, but is expected to land just above $30,000. 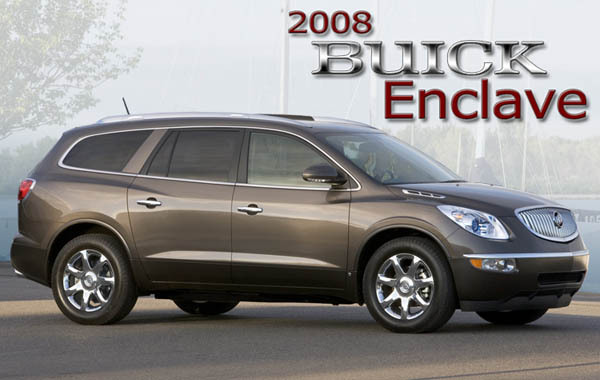 The 2008 Buick Enclave will arrive in dealer showrooms in Summer 2007.